Beginning on April 2, 2005, the Tennessee State Library and Archives (TSLA) will be presenting a new exhibit, "A rose by any other name...": Highlights from the Kenneth Rose Music Collection. Kenneth D. Rose was a faculty member at Ward-Belmont College in Nashville from 1918 to 1952. He began collecting in 1935, and assembled a vast and diverse selection of sheet music. This exhibit will focus on a few areas of his collection, such as Confederate sheet music, comic songs, minstrel songs, war songs, patriotic songs, and sports songs. Although these themes will be the primary focus of the exhibit, Rose also collected many other types of song sheets. For further information about the exhibit, contact exhibits.tsla@tn.gov. This exhibit features the Kenneth D. Rose Sheet Music Collection, which includes Confederate sheet music, comic, minstrel, war, and sports songs, and much more. Although these areas will be the primary focus of this exhibit, Rose also collected music sheets ranging from songs about stamp collecting to tunes about politics and presidents. Rose’s collection contains more than 20,000 pieces of music, only a small percentage of which are shown in this exhibit. 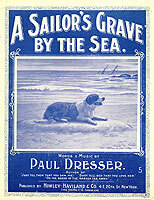 Sheet music gained widespread popularity in America in the mid-nineteenth century, when it became more readily available to the general public. Americans who could afford a piano were eager to buy and play sheet music in the comfort of their own homes. Many were inclined to teach themselves the fundamentals of playing music, with the aid of an instruction book and perhaps with the additional help from a family member or friend. During the first half of the twentieth century, popular sheet music publishing grew tremendously, but this trend eventually lost ground with the popularity of recorded music. As Americans became more attached to their radios and later, their televisions, records, tapes, and CDs, they became more and more inclined to listen to recordings of music rather than playing it on their own. Private collectors such as Rose were some of the first individuals to see the value of collecting sheet music. They recognized that there was a great deal of information about popular American culture – both visual, musical, and written – contained within these items. Major universities and archival repositories eventually realized the importance of popular American musical culture. The Tennessee State Library and Archives (TSLA) received Rose’s collection in 1956. His works were exhibited more than fifty years ago at the Centennial Club, in 1942, but have not received wide exposure since the 1940s and 1950s. 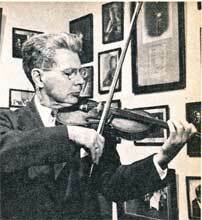 Kenneth Daniel Rose (1888–1960) joined the faculty of the Ward-Belmont Conservatory of Music in 1918, and served as the head of the violin department from 1918 to 1952. Born in Wabash, Indiana, Rose studied at the Metropolitan School of Music and the Conservatory of Butler University, both in Indianapolis. Rose frequently traveled abroad, working under the tutelage of several noted musicians, including Suky in Prague, Arthur Hartmann in Paris, and George Lehmann in Berlin. During a stay in Chicago, he studied under Leopold Auer. In Indianapolis, Rose served with the Germanhouse Orchestra and as Concertmaster of the Indianapolis Symphony. After relocating to Nashville, Rose was a soloist, guest conductor, and concertmaster with the old Nashville Symphony. Rose began collecting sheet music in 1935 when he visited a small bookshop in northern Indiana. Previously a collector of rare books, Rose shifted his collecting focus when he “sensed that in these albums lay, quite possibly, the germ of a new and intriguing challenge.” (Tennessee Historical Quarterly 15, no. 4, December 1956). Within two years, Rose had discarded his antiquarian books in favor of “thousands of music sheets, many bound into volumes…. Little then was it suspected that this would lead to contacts with nationally known fellow enthusiasts, that libraries and universities would become interested supporters, or that the collection would assume its present proportions, eventually to be exhibited locally and elsewhere, with the supreme accolade of a display in Life” (Tennessee Historical Quarterly 15, no. 4, December 1956). In addition to collecting sheet music, Rose studied Nashville’s music history. In 1956, he donated his sheet music collection and his personal papers, the Kenneth Daniel Rose Papers, 1879-1957, to the Tennessee State Library and Archives. For those interested in reading more about Rose’s involvement in music collecting, see “The Story of a Music Collection,” in the December 1956 issue of the Tennessee Historical Quarterly, available upon request. Please contact Gwynn Thayer at 615-253-3469 or gwynn.thayer@state.tn.us for a copy. In addition to collecting music sheets directly related to the Civil War or the Confederacy, Rose collected items pertaining to numerous political events, presidents, and wars, including the American Revolution, the War of 1812, World War I, and World War II. He also acquired numerous patriotic American songs, including, most notably, the Star Spangled Banner and The Battle of the Wabash. This patriotic song, published in the interest of national defense, was inspired by the famous United States Army poster, “Defend Your Country,” painted by Major Tom B. Woodburn, USA, noted artist, who collaborated on the song with the composers. There were approximately 6,000 separate music titles published in the Southern States during the Civil War; Rose himself collected about 275. About 175 of the music sheets were copyrighted in the South, and read “Copyrighted by the Confederate States of America.” Some of the sheets were published without adequate supplies of ink, paper, and other tools used by printers. This could give music sheets published in the South a different appearance from those that were published in the North. Confederate music sheets were especially prized by music collectors. One of Kenneth Rose’s collecting interests was music sheets related to sporting events and recreational activities. He collected songs pertaining to baseball, boxing, tennis, cycling, yachting, aviation, horse racing, hunting, circuses, automobiles, and more. Many of the lyrics and cover illustrations of these music sheets capture the spirit of the times and enthusiasm and fanfare surrounding these new American pastimes. The original Cincinnati Red Stockings were baseball’s first openly all professional team founded in 1869. The team won 130 games in a row between 1869 and 1870 before they fell to the Brooklyn Atlantics. In 1871, George Wright, one of the Stockings’ stars, took most of his best players to Boston and founded the Boston Red Stockings. At the turn of the century, the Cincinnati Red Stockings shortened their name to the Reds, so as not to be confused with the Boston Red Stockings team who had also shortened their name to the Red Sox. Within the tradition of comic songs, minstrels were exceedingly popular in American culture beginning in the 1830s and throughout the early decades of the twentieth century. Much has been written about this tradition, for understanding this custom can reveal a great deal about relations between whites and African Americans in the nineteenth century. In many cases, white men dressed up as African Americans – the “black-face” minstrel tradition – and sang minstrel songs during rowdy theatrical performances. Blacks were frequently characterized as rowdy, comic fools. African Americans also created all-black minstrel shows, especially after the Civil War. Minstrel shows traveled throughout America and were frequented by many different types of American audiences, especially the lower and middle class. Many of the songs were overtly racist and would be difficult for the modern audience to tolerate, but they were a significant part of American popular culture in the nineteenth and early twentieth centuries. For more information on this musical tradition, see Eric Lott’s book Love and Theft: Blackface Minstrelsy and the American Working Class or Thomas L. Morgan and William Barlow’s book From Cakewalks to Concert Halls: An Illustrated History of African American Popular Music from 1895 to 1930. To the modern eye, many of the sheet music illustrations portray African Americans in an offensive manner. Many show African Americans in a stereotyped fashion, while others are more subtle in their racism. The “Swedish Nightingale,” Jenny Lind (1820–1887), traveled throughout the United States from 1850 to 1852 with P. T. Barnum. She visited Nashville for two performances in 1851, on March 31 and April 2. A notice in the Daily Nashville Union on March 29, 1851, announced that “Jenny Lind, this wonderful woman, the very enchantress of song, is now coming up our river and is soon to be in Nashville.” A large crowd assembled near Nashville’s wharf to see her disembark from the steamboat from St. Louis. The audience packed the old Adelphi Theater, once located on North Cherry Street and Cedar Street (present day Fourth Avenue North and Charlotte Avenue). In order to prepare for her visit, William Strickland, the architect of the Tennessee State Capitol, was hired to add a tier to accommodate a larger audience. The first ticket was auctioned off at $200, and Lind ultimately brought in more than $12,000 for her Nashville performances. Lind’s numerous public appearances launched a fad known as “Lindomania”; many streets, schools, and theatres were named after her, and she achieved extraordinary popularity in America for a number of years. For more information about Jenny Lind’s performance in Nashville, see Apollo’s Struggle: A Performing Arts Odyssey in the Athens of the South, Nashville, Tennessee, by Martha Rivers Ingram with D. B. Kellogg. Comic songs have a rich tradition that goes back to the beginnings of the human experience. Although many nineteenth-century and early twentieth-century songs have since been forgotten, they were at one time quite popular with a middle-class audience who was eager to buy song sheets and play the music in their homes. Many songs mocked various types of people, including Quakers, New Yorkers, Germans, Chinese, Irish, Jews, and African-Americans. Dialect songs mocked accents and modes of speech. Other types of comic songs were character-based or topical in nature. This item is notable for its creative design of illustrations and musical lines. A comic song, the narrator claims that his normally high-spirited, bonny wife becomes ill-tempered during washing day. Davis, Louise. “Work of Three Centuries.” Nashville Tennessean Magazine (November 5, 1950): 6-8, 22. Dichter, Harry. Handbook of American Sheet Music. Philadelphia: Harry Dichter, 1953. Elliker, Calvin. “Toward a Definition of Sheet Music.” Notes 55, no. 4 (June 1999): 835-859. Kenneth Daniel Rose Papers, 1879-1957, Manuscripts Section, Tennessee State Library and Archives, Nashville, Tennessee. “Kenneth Rose Funeral Tuesday; Noted Violinist,” in The Nashville Banner (April 11, 1960): 8. Levy, Lester S. “Sheet Music Buffs and Their Collections: A Personal Memoir.” American Music 1, no. 2 (Winter 1983): 90-99. Morrissey, Ralph G. “In the Air and on the Shelves.” Nashville Tennessean Magazine (December 15, 1946): 28-29. Morrissey, Ralph G. “The Singing Confederacy.” Nashville Tennessean Magazine (January 5, 1947): 26-27. Rose, Kenneth. “The Story of a Music Collection.” Tennessee Historical Quarterly 15, no. 4 (December 1956): 356-363. Rose, Kenneth. Vertical File at the Tennessee State Library and Archives, Nashville, Tennessee. Rose Music Collection, Manuscripts Section, Tennessee State Library and Archives, Nashville, Tennessee. Wharton, J. G. “Humor, Sentiment, and Satire Basis of Songs Confederate Troopers Sang.” Nashville Tennessean (March 1, 1942): A-11. Wharton, J. G. “United States Needs Stirring War Song Like Martial Ditties of Confederacy.” Nashville Tennessean (February 22, 1942): A-9.